This unique pent shed has a windowless design to ensure maximum privacy. Constructed with 12mm Shiplap tongue and groove cladding, it also includes some pretty great security features too. A pad bolt is installed on the wide single door and the cladding proves very difficult to break through. It is actually one of the largest sized pent sheds available on the market and offers an incredible amount of storage space. The building isn’t just practical, it also has a stylish finish which ensures it looks great in the garden. If you’d prefer a painted finish, coloured treatments can help to add a more personalised style. Waltons have made sure that every aspect of the building has been created with a strong, high quality finish. Even the smallest details have had a lot of effort put into making sure they function exactly how they should. The manufacturer even throws in a free Golden Brown 5L treatment and a 28mm floor support kit. This is great if you will be storing heavier items as the solid sheet floor included is mainly designed with mid-weight storage in mind. With a number of upgrades available, you can ensure you get the most out of this affordable, high quality building. Like many wooden sheds, this one isn’t painted. Whilst we like this design, you may want to add a coat of paint or a coloured treatment to give it a more stylish, personalised look. 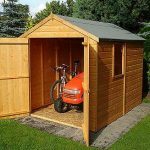 This is a good size wooden storage shed, ideal for keeping everything from bicycles and general garden storage to lawnmowers and boxes. However, if you are going to be keeping heavy belongings in the building, you will need to upgrade the floor. 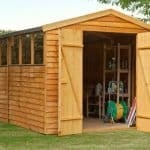 With this shed you’ll also find it has more width than height, so it may not be the best choice for taller tools or equipment. 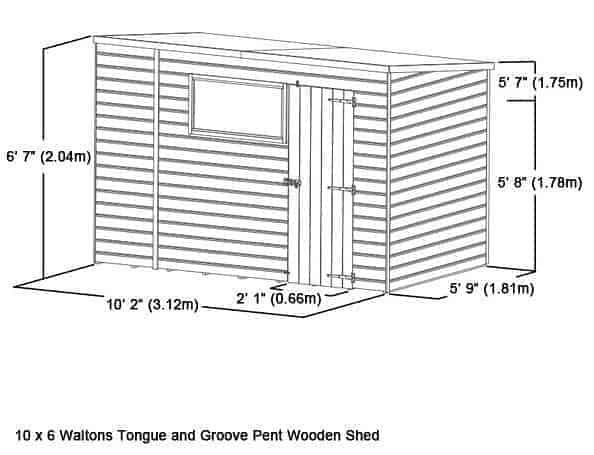 Pent sheds have different measurements to apex sheds. Most significantly, they are taller at one side of the building than they are at the other. As you can see, this one features a shorter back and this is due to the sloping pent roof. It is designed this way so that it can easily be placed in front of fences, buildings and low hanging trees. It may look notably shorter than apex roof sheds, but it still gives you a good amount of height. Like many pent sheds, this one features more width than depth. The single door has a standard width that you’ll find on many outdoor sheds. An 8mm solid sheet board, pent roof makes this building great for gardens with height limitations. For example, if your garden has low-hanging trees, the more traditional and common apex style roof could pose a problem, whereas the pent roof will easily slide underneath the tree branches. This style roof also makes it easier to install it in front of fences or other buildings. Whilst it may have a lower design, it still benefits from a sloping roof which provides the same water-protective benefits as an apex roof. The sand felt provided also helps to protect it against rainwater, as well as debris. The floor is also constructed with solid sheet board materials, measuring a slightly thicker 10mm. This isn’t the sturdiest floor, but if you’re going to be using the shed to keep light or medium weight gardening tools and bicycles, you should find it sufficient enough. The manufacturer does provide a 28mm support pack which will give you additional peace of mind. There is also the option to upgrade to an extra strength floor too which you’ll learn more about in the customisation options below. 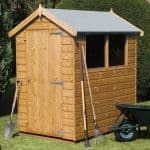 As part of the Select range, this shed comes with Shiplap tongue and groove cladding. This has a number of benefits and is typically found on high-end buildings. Most notably, each panel benefits from an indented groove which acts as a natural water drainage system. Channelling the water away from the building, it complements the waterproof design of the pent roof. You’ll also see that compared to overlap cladding, this has a very tight, stylish and smooth design. The panels interlock with each other to create a tight water-seal. As it measures 12mm thick, it also gives the shed a more secure design. An expansion gap is also added to the building, helping to protect its stability if the timber warps throughout the seasons. 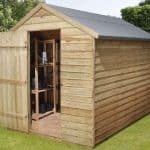 If you’re planning on assembling the shed yourself, you’ll also be pleased to know the tongue and groove cladding makes it much easier to slot the panels together. Just like the majority of sheds in the Walton’s collection, this one comes with 28mm x 28mm framing. It’s a strong, sturdy frame that has been planed and rounded in order to reduce splinters. The corners of the building are also double framed for moisture resistance and stability. You do need to treat this building once it has been erected, despite the fact it has been water treated prior to shipment. The treatment provided by the manufacturer isn’t designed to provide long lasting protection and they do strongly recommend using a spirit based preservative after the shed has been assembled. We agree with this, even though Shiplap constructed buildings do provide longer lasting protection than overlap. So what’s the difference between water and spirit treatments? Well, water treatments form a strong protective barrier on the surface of the wood. Spirit treatments on the other hand penetrate into the wood, forming a barrier inside the timber, as well as on the surface. The results equal longer lasting and much more effective water-resistance. Perhaps the most beneficial thing about spirit treatments is that they don’t always need to be applied once a year. This only applies if you are treating a Shiplap clad shed however. Overlap clad buildings need to be treated annually regardless of which treatment type you use. A 10 year anti rot guarantee comes with the shed, though it requires you to maintain adequate treatments. A single, standard width door is included and it is fitted with a pad bolt. It is braced for maximum stability so you won’t need to worry about sagging. It’s quite unusual for a building of this size to only have a single door. However, it does provide a good amount of access space and we feel it helps to add to the shed’s secure design. Waltons offer a number of variations of this building and this model comes with no windows. Therefore we’d recommend this variation if you’re planning on storing anything valuable. Of course, this does mean if you want to use it to work in, you will likely need to install an electrical pack as there is no natural lighting. These are expensive and provide both a light source and power to the building. This is essential if you need to operate machinery or equipment. Shiplap cladding automatically gives a building a more secure design. It is a lot thicker than overlap which makes it more difficult for anybody to break into. However, this appears to be the only secure feature of the building. A pad bolt is included on the door, but it will allow you to add a padlock. It is just a shame that Walton’s don’t supply the padlock free with the shed. The fact people can’t view the contents of the building because of its great windowless design does add some security. It also means that provided you install a good lock, you can store anything valuable in here too. The customisation options and extras give you a chance to improve various aspects of the shed to ensure it meets your individual needs. 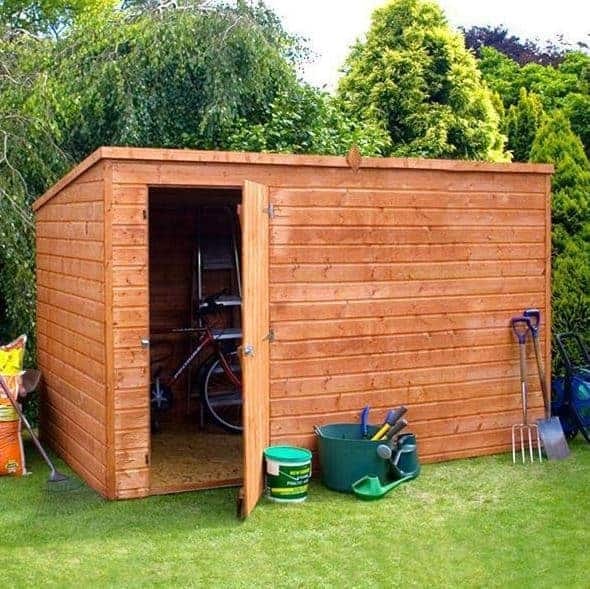 With this shed there are a couple of extras that we feel you’ll find more useful than others. The superior duty felt is one of them. Technically speaking, this felt isn’t absolutely necessary as the felt that comes with the building is designed with heavy duty protection in mind. So it should last throughout the manufacturer’s warranty period. However, the superior duty felt does offer a higher amount of protection and is made out of fiberglass which is less prone to deteriorate over time. It also comes in olive green as well as charcoal so that’s a great feature for those who want to add a different colour option to the shed. As the building includes a 10mm solid sheet board floor, Waltons have provided a free support kit which strengthens the structure up to 28mm. We find this is great for medium weight storage. However, if you’re looking for ultimate peace of mind, we do recommend the extra strength support pack. Just like the free pack provided, the joists in this kit will just slot in between the standard existing joists. So it couldn’t be easier to install. It’s also not very expensive so could be worth investing in it anyway just for the peace of mind alone. The company does offer a very high quality padlock that is supplied along with a hasp and staple. However, as the shed already comes with a pad bolt, this isn’t something you definitely need. Like the extra strength floor kit, it basically just gives you more peace of mind as it will improve the security of the building. It also has the great advantage of being 100% weatherproof and it offers an excellent double locking feature. You also have a good choice of treatments available. The water based Cuprinol treatments tend to be a popular choice due to the range of colours they come in. For example, you can choose from Lavender or Country Cream. Before selecting a treatment however, it’s worth noting that Waltons supply a free tub of Golden Brown treatment which will cover the shed for the first year. Finally there’s a range of Draper accessories, with the 5 Tread Aluminium Step Ladders being one of the most potentially useful. If you’re unfamiliar with Draper, it’s basically a high quality manufacturer of power tools and DIY equipment. 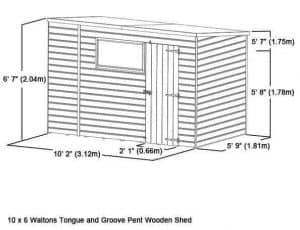 None of the accessories available are essential, but they could be useful if you’re going to be using this pent shed as a workshop. If the shed was constructed purely with tongue and groove cladding, we’d have given it top marks for quality. However, it is a little disappointing that solid sheet materials are included for the floor and roof. All around though it is a great quality building. The exterior walls are built to last, but there are parts of the shed that aren’t as durable as they could be. Upgrades can be added to improve this, though the regular treatments are also something to consider. Without treatments, the shed likely won’t last the full 10 year anti-rot warranty. The amount of space available is great, but as it is sold, the shed is only suitable for light storage. The fact it comes with a free floor support kit has increased its rating, but we still feel the extra strength support kit is needed to get its full storage potential. 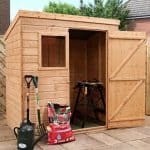 The only things we’d recommend you keep in mind with the installation of this shed is the time it will take you to build and the weight of the panels. Shiplap tongue and groove cladding is pretty thick and therefore pretty heavy. It is also likely to take at least half a day to erect. As it is created with superior quality cladding, this shed does offer great value for money. It requires few upgrades and the potential to save money on maintaining the building is also an added benefit. Final Thoughts: You’re bound to love this stylish, private and secure pent storage shed. 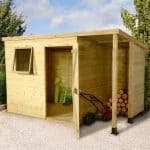 Offering a fantastic amount of space to store all of your gardening essentials, Waltons have made sure that the building is capable of withstanding the unpredictable British weather. The fact you can choose which side you want to install the door is a great advantage and its pent style roof makes it an ideal choice for installing under low hanging trees. Despite its great luxury features, the shed comes at a really affordable cost. All in all we love the design and durability of this building and would definitely recommend it to those looking for a unique, spacious storage shed.